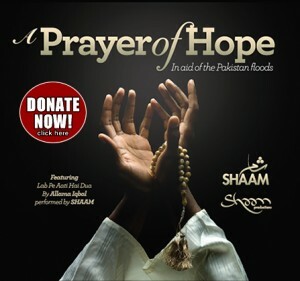 Having seen the heartbreaking images, we, like millions around the world were devastated and wanted to contribute as artists by releasing the “Prayer of Hope” single for the remarkable people of Pakistan and pray that you too will support the cause of those affected by donating generously. ‘Lab Pe Aati Hai Dua’ (The longing comes to my lips as Supplication) was chosen by us as it is the most widely recognised prayer by millions of people around the world, written by Pakistan’s most famous poet Allama Iqbal. It is imperative that the disaster is not forgotten as rebuilding this region and the lives of those affected will take many years if not decades to re-establish. SHAAM would like to sincerely thank everybody who came on board and supported the cause; all those individuals who sacrifi ced their time for the sake of Allah (swt), may you get a just reward in this world and the hereafter, amin. Na’eem Raza and Sammera Ali for your extreme professionalism, optimism, sincerity and for supporting the campaign. Matthew E. Green (you are a star), Sister Asma Ajaz-Ali and all the children from Al Medina Choir (Anwar Rahman, Asghar Ali, Imaadh Ahmed, Sana Ahmed, Reemah Suleman, Sabah Lodhi, Yusuf Ali, Hamza Rashid, Amarah Baber, Aamna Javed, Khadeeja Saffi ya Rahman, Aisha Ilyas, Zayn-Ul-Abidin Ilyas), Amani Suleman, Zahrah Ahmed, Qari Tanveer Iqbal, Steve Ash, pupils from the School Choir of King Edward VI Camp Hill School for Boys, Jacob Genders, Tom Dowling, Chris Jones, Oliver Palmer, Edward Lawrence, Alex Pattison, Kieran Ahern, & Simon Palmer (Head of Music). Jon Cotton, Jordon Morris, Aiden Laverty of Artisan, Juggy, The Pak Foods Family, Andrew Sparks, Azeem Suleman, Zain ul Abideen of partners in Print, Ruh of Make Believe, Yusuf & Nadeem of Media Works, Tayyeb Shah, Mukhtar ul Mustafa, Farkhanda Faraz, Saydia Iqbal and Atif Saghir. Photography courtesy of Islamic Relief and Human Appeal.